A grim, wonderful and classic fantasy tale for children. A poor maltreated boy is working as a chimney-sweep. He drowns, but continue to live and learn in the magical water world. Perhaps he and his friends–drowned humans like him–can get a second chance among the living? An important aspect of The Water-Babies, A Fairy Tale for a Land Baby (first published 1862-63) is its criticism of child labour; the novel is credited with easing the passage of the Chimney Sweepers Regulation Act of 1864, which prohibited the use of minors as chimney-sweeps. This fairy tale for the 19th century is also of interest in the history of science. 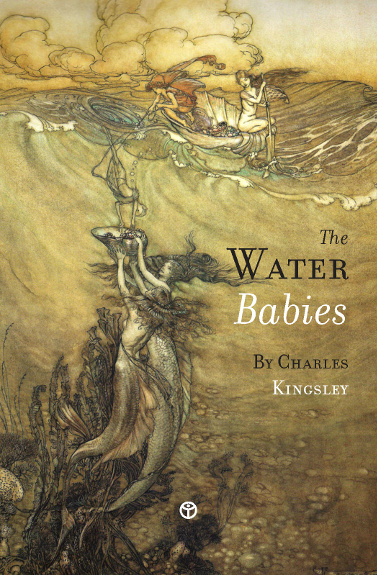 Charles Kingsley (1819-75) was a famous author and a broad church priest of the Church of England, with a keen interest in biology and natural science; he was an early supporter of Darwinism. With its metamorphoses and evolving organisms, The Water-Babies popularized Darwin’s theory of evolution for children, though with a bent for Lamarckism–behaviour can be a driving force behind the evolution.